Published: Mar 10, 2000 to ? 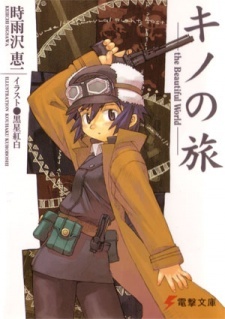 Kino no Tabi: The Beautiful World appeared on the Kono Light Novel ga Sugoi! rankings under the Best Light Novel category three times: 2nd place in 2006, 5th place in 2007, and 6th place in 2008. As of October 2014, the series has sold more than 8 million novels. Tokyopop published the first novel of the series in English on October 3, 2006; however, due to issues with the licensors, they were unable to release further volumes. The series has also been published in German, Chinese, Korean, and Thai. It follows the storys in a different order then the anime. But if you've seen the anime you will notice immediately that you've seen these stories. It might be better to read this first that way later you can see it come to life on the screen. This was a great read from start to finish. The story of Kino and her Journey with Hermes through the odd, dangerous, frightening, yet beautiful world. Every place she goes is another view through diversity. Some chapters were simple and made you smile, other chapters make you jump into the action. Its unfortunate that only the first volume is released in English. The chapters have been rearranged compared to the Japanese original in an attempt to make the story more fluid. Unfortunately this might have been the reason TP was only able to release 1 volume in English. The anime definitely is similar to the novel. I would suggest you read the novel, which is the original source, first, then watch the anime after to further enhance your imagination of what you've read. As far as the art goes, it is basic and simple, which works for this novel. The brief moments of visual art help rejuvenate your imagination and guide you to understanding the author's vision and intentions. It was an enjoyable read and I hope Tokyopop can solve their problems and release the next couple of volumes. This is the strongest point and the foundation of its successes. The novel is relatively simple and straightforward. It basically chronicles the journey of Kino who travels around the country on a motorrad (AKA: motorcycle). They visit many towns and cities, each with its own personality. It is written in a poetic way, while explore interesting issues like democracy, cannibalism, purpose in life, ect in a fairy-tale atmosphere with a mix of action too. The brutality, loneliness, nonsense, oppression and tragedy are what bring beauty to this story. I can guaranty, you will not find a book like this anywhere else. Since "Kino no Tabi" is literature novel, there are only a scraps of illustrations. Therefore, I will not include it in my review. Kino and Hermes are the main characters; however, there are a few chapters dedicated to Shizu (also another traveller) too. Always, the story isn't devoted in their character development; rather their interesting interacts with the locals because each person is unique. Each chapter is devoted to their stay at a town, and their time spending to unravel its mystery. There are some that stands outs more than the others. I admit, I rather skip a few because it didn't grab my attention as the others had. Regardless, those that did leave you a profound impression. I would HIGHLY recommend to anyone who enjoys pondering meaningful message behind a story and love surprises. However, it might deter those who aren't fond of slight-a-life story. Although, you might appreciated what you learn from it if you give it a chance. Unfortunately, only Volume 1 (English) is currently release as of 2013. But you can find other volumes copies that are translation by dedicated people online. "The world is not beautiful. Therefore it is." From the start this story is bring us to many perspective of world , where there is many type of of people with a lot of different reason surrounding it, while our MC, Kino traveling between it. The world that Kino traveling is usually vastly different than what it should be, with lot of twist and unexpected solution for it, and to find it cruel to, is sometimes just the prejudice of the reader, because the reason that surround it. this novel bring out the characters and arts very carefully, so the meaning of the story could be conveyed to us with effective depiction. It's definitely one of the best light novel, at least for me, as it is widening our line of sight of world, as it's not beautiful,but it is.